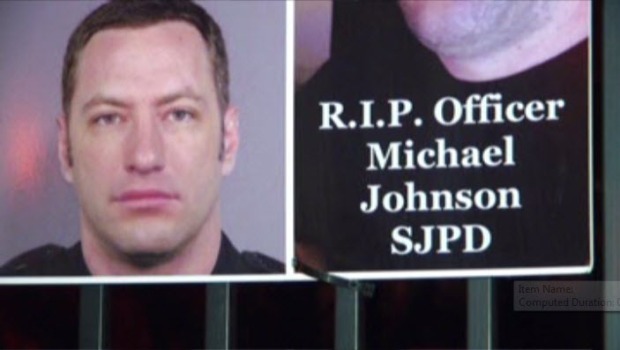 Memorial for San Jose police officer Michael Johnson killed March 24, 2015 in the line of duty. Slain San Jose Police Officer Michael Johnson was inducted into the Police Amateur Athletic Foundation Hall of Fame Thursday night – and in his place, his widow accepted the award. Johnson was a star athlete, winning gold medals in both judo and shooting at the US police and fire championships. He was shot and killed by a suspect in March. "I miss my husband every day,"
The San Jose police officer laid to rest earlier this year after he was shot and killed while responding to an emergency will be inducted into the Police Amateur Athletic Foundation. Robert Handa reports.
. "He was a very bright spot in a lot of people's lives, especially his whole family. We're taking it one day at a time."